Run Your Own Game or Tournament! Do you want to run your own game or schedule tournaments for others to play? To run your own game / tournament on site, please make and account and log in. Click on Information and then Host Panels / Meetups / Events. Create a new Panel and select Table top Game as your panel type. Fill out the description and any comments to the convention you would like (day and times). If / after you are approved, then the administration will select your times (if available) or, you will be able to select the times yourself. We are looking for all types of table top games - card games, role playing, Warhammer, etc. Please feel free to ask us if you need a special setup for your game / tournament. To contact us, select Contact on the menu bar and select Table Top Gaming. 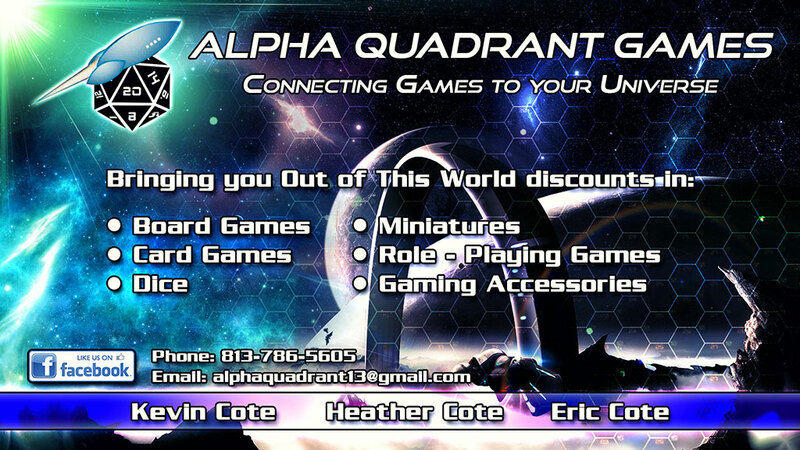 Alpha Quadrant Games is your go to source for card games like Munchkin and board games like Firefly. Ask us for our latest list of games now!